Intel introduced its Xeon 5100 processor, a chip intended for servers that will double the performance of previous Xeons while using 40% less power. The processor, formerly codenamed Woodcrest, will be available in six different versions from 1.6GHz to 3GHz and will integrate a 4MB L2 cache. Pricing ranges from $209 for the 1.6GHz 5110, up to $851 for the fastest 3.0GHz 5160 chip. This is just the beginning of a flurry of releases from Intel featuring this latest low-power/high-efficiency configuration. Next on the road map is Conroe, the desktop version of the Xeon 5100, which Intel will call the Core 2 Duo E4000/E6000 series, set for release on July 23rd. 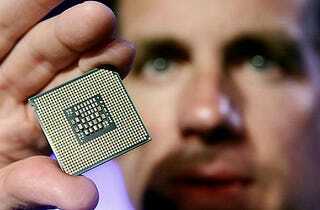 After that will be the Core 2 Duo T5000/T7000 series, mobile chips which will make their debut in August or September. As the heat produced by these chips diminishes, the battle between Intel and AMD heats up. This is going to be good.